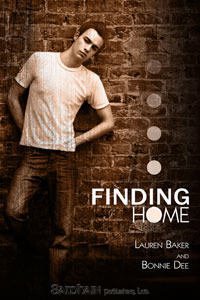 I came across Finding Home by Lauren Baker and Bonnie Dee on the Best Older Woman/Younger Man recommendation list from Goodreads while searching for a comparison piece to On the Island. Despite the fact that I determined that this novel wasn’t suitable for comparison, I found that Finding Home had a great deal of merit as a story in its own right. Megan is a young copywriter frustrated with her inability to get a writing assignment at the paper where she works. Impetuously she decides to take the initiative to find her own story if the powers that be will not give her one to cover. She quickly makes a place for herself among the youth working the street, guided by Mouth, a homeless teen who supports himself largely through prostitution. After he is beaten and robbed Megan takes him in to the consternation of her friends and family setting the stage for an unusual romance. Perhaps I am in the minority but the age difference in this novel seemed pretty unobjectionable considering the context of the story itself. The other challenges, mainly his past, that they would face as a couple it would seem that the difference in their ages was paltry at best. Regardless, Baker and Dee have created a highly readable story filled with the angst and grit that you would imagine is intrinsic to life on the street.